THPBlog: Campbell Timberlands to log on steep and unstable slopes east of Fort Bragg, CA. Campbell Timberlands to log on steep and unstable slopes east of Fort Bragg, CA. 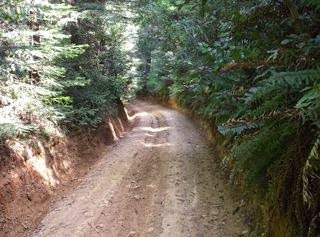 This THP is about 8 miles east of the town of Fort Bragg, CA and Highway 1 at an elevation of 440 to 1,640 feet. The THP area drains into the South Fork of the Ten Mile River and the Ten Mile River which is listed as impaired for sediment, temperature and siltation. Campbell Timberlands is planning a tractor and cable logging operation on steep and unstable slopes in redwood, Douglas fir, western hemlock and grand fir forests. There are 14 landslide terrain sites including multiple debris slides related to poorly placed historic skid roads, debris flows related to watercourses, disrupted ground, and steep headwall swales. Campbell Timberlands is planning to use tractors on dormant deep seated landslide terrain in units F and G, use ground based equipment on steep slopes over 65% grade within unit G, and to use ground based equipment on a tractor road inside a watercourse area within unit F. They also want to use ground based equipment on slopes over 50% grade with a moderate or high erosion hazard rating in units B and G, and to use ground based equipment in units designated for cable logging within units B and C. There are 16 road drainage sites planned for work including rocking, dip construction, and culvert repair and replacement. For spotted owl site MEN0119; this THP will remove 1.9 acres of foraging habitat within .7 mi, and 16 acres of nesting/roosting habitat within .7 mi. More information is available on the THP Tracking Center website.